When summer rolls around and it’s time to start making jams and jellies again, I stock up on pectin. Many of the recipes I make call for regular pectin, which requires cooking the jam or jelly, but I also like instant pectin for no-cook jams. Skipping the cooking process keeps the wonderful fresh flavor of the fruit and also saves me time, something I can always use more of. Instant pectin is perfect for small batches of 6 jars or less, so it’s also great for those times when I don’t have enough fruit for a large batch. It’s available in 0.6 ounce envelopes for small batches and 4.7 ounce jars. The jar of pectin recommends making no more than 6 jars of jam at a time with the instant pectin as larger batches may not set correctly. For this jam you just need strawberries, honey, instant pectin, and moscato wine. With the instant pectin I can whip this up in about 30 minutes, including resting time. The wine is sweet so I use less honey, but the jam still has a full rich flavor. 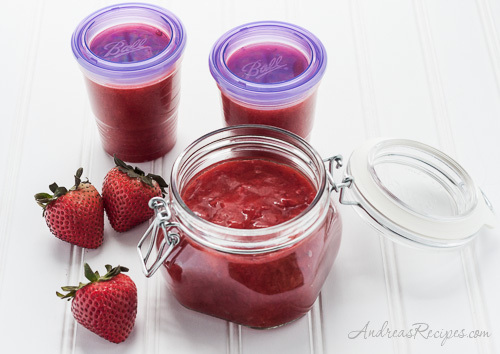 The jam keeps well in plastic freezer jars or you can put it in decorative jars for gifts. 1. In the mixing bowl, stir together the crushed strawberries, honey, and wine, and allow it to sit about 10 minutes. 2. Stir in the pectin until well mixed, about 3 minutes. 3. Pour into the freezer jars and seal. Let the jars stand at room temperature until the mixture thickens, about 30 minutes. Store in the refrigerator for up to 3 weeks or in the freezer for several months. Why do you use the wine? Is it to cut down on the sugar? 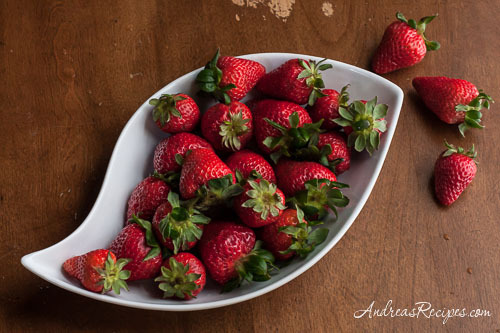 Accentuate the flavor of the strawberries? Affect how it gels? I am not familiar with moscato wine so I can’t figure out how it impacts the jam. Hi Elsie. Moscato (aka muscat) wine is is from muscat grapes and is known for it’s slightly sweet and grapey flavor. I like adding it to dishes with strawberries for the sweetness and depth of flavor it adds, such as this zabaglione with strawberries and moscato. The jam is thick but not firm, as one might expect from the honey and the wine. I am new to making jelly. I have a ton of jalapenos from my backyard garden and want to make some pepper jelly for my cream cheese and crackers (my true love)! 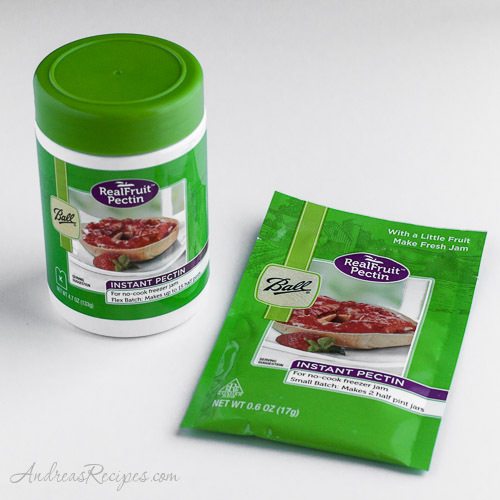 I sent my husband to the store to get pectin, and he came back with instant – but we can’t find a recipe for jalapeno jelly with INSTANT pectin. Do you have one?